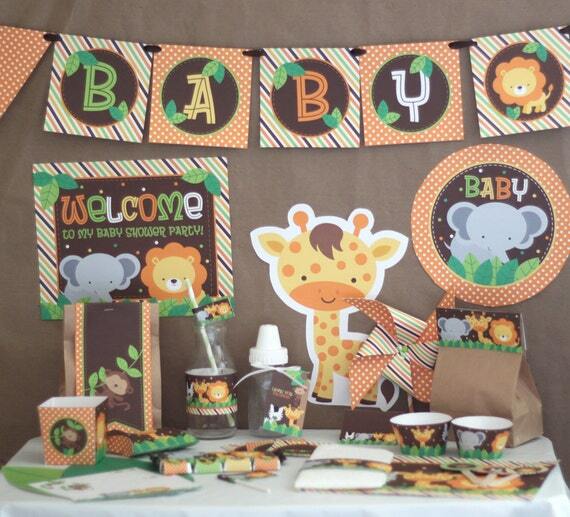 Celebrate with a giraffe, lion, monkey and zebra safari animals baby shower decorations for a printable neutral gender jungle party. If your interested in this option the additional fee is $10 NAME PERSONALIZATION. Please select this option in the drop down menu before adding it to your cart. The NAME PERSONALIZATION will take about 48 - 72 hrs (2-3 business days)* to complete. If you need it sooner then 48 - 72 hrs (2-3 business days)* a rush fee will apply. NON PERSONALIZED PARTY DECORATIONS ORDERS: file will be sent to your Etsy conversation account within 24 hrs after your payment is completed. NAME PERSONALIZATION ORDERS: will take about 48 - 72 hrs (2-3 business days)* to complete. If you need it sooner then 48 - 72 hrs (2-3 business days)* a rush fee will apply. The Name personalization file will be sent to your Etsy conversation account. Your will receive a DIGITAL file that will be sent to your Etsy Conversation electronically with a link to download the ***NON-EDITABLE PDF*** file.